This paper describes our geographical text analysis and geotagging experiments in the context of the Multimedia Placing Task at MediaEval 2010 evaluation. The task consists of predicting the most probable coordinates of Flickr videos. We used a Natural Language Processing approach trying to match geographical place names in the Flickr users textual annotations. The resources employed to deal with this task were the Geonames geographical gazetteer, stopwords lists from several languages, and an electronic English dictionary. We used two geographical focus disambiguation strategies, one based on population heuristics and another that combines geographical knowledge and population heuristics. The second strategy does achieve the best results. Using stopwords lists and the English dictionary as a lter for ambiguous place names also improves the results. Ferrés, D.; Rodriguez, H. TALP at MediaEval 2010 placing task: geographical focus detection of Flickr textual annotations. A: MediaEval Workshop. 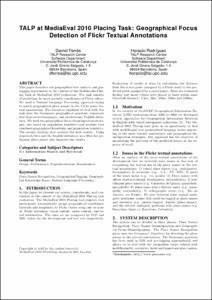 "Working notes proceedings of the MediaEval 2010 workshop: Pisa, Italy, October 24, 2010". Pisa: 2010.